Into her life comes the perfect Ryan who charms every relative in sight and actually wins over Sophie’s rebellious heart in two weeks. He also showers her with seeds and guppies to develop her nurturing side. She only knows him on a first name basis and is forced to revert to all kinds of stupid stories with her friends and family to keep the pretence going. Of course there is the wandering Yatan, with whom Sophie once had a massive affair, who spends his life crisscrossing South East Asia, from Australia to Cambodia and back in a footloose and fancy free fashion and who, incidentally, is of royal blood. Yatan abandons his long distance phone calls and turns up at Sophie’s house, showing every sign that he is jealous of Ryan. Caught in the horns of a dilemma, Sophie rocks back and forth between the two. Suddenly from having no men at all, she realizes that she actually has two. All this in between giving up her job as a research data analyst and trying to sort out the lives of her friends Dee and Bonnie who feel a break up coach should have all the answers. Threaded through the storyline are posts from Sophie’s break up blog which comment on the episodes that they follow. What might have seemed usual in Mumbai or Delhi, becomes quirkier in Chennai, a seemingly conservative city. Sophie digs into Oreo cheese cake and tries to understand what true love really means so that she can make a decision. Most readers will probably think that they know what’s coming and wonder why the book seems so obvious – which does not detract from its entertainment value. Of course, what is obvious is not necessarily correct and one could guess that Balan too was slightly unsure about how to end the book until right at the end because the ending seems rather hurried and the moment of hope cramped into the bottom of the last page. This is author Balan’s second book. A blogger herself, and a single mother, she knows what makes for social acceptability in men and through her Sophie is constantly ticking off the check boxes. Balan seems to have a thing for Bengalis – Bonnie is Bengali and much desired by all the boys, except that she doesn’t realize it, and the almost too perfect Ryan is a Bengali-Goan cross. 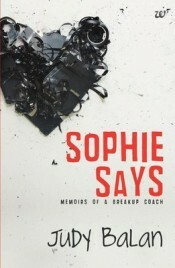 In the end Sophie Says is a commentary on 21st century relationship issues which split up into commitment issues, space issues, gender issues and every other kind of issue possible. While the cover is subtle and minimalistic one could have asked for something bright and funny and yes, Charleton Heston is not spelt that way. No Comments on "Sophie Says"